We have optimized the Reports engine to make better use of multi-processor machines. Our internal tests have shown an improvement in report speed of up to 59%! Many customers have been experiencing issues with Active Directory integration since version 1.0. Usernames would still be displayed in the Domain\Username format, and no Departments would be displayed at all. We have finally tracked down the cause and have confirmed the fix with many existing customers. 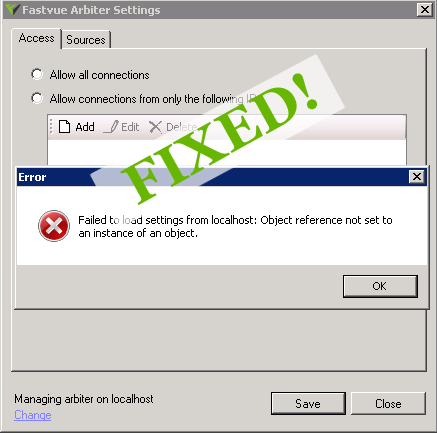 If you are logging to W3C text logs and you have changed the logging location, you need to specify this location in the Fastvue Arbiter Settings application. When using this application, some customers received the error “Failed to load settings from localhost: Object reference not set to an instance of an object”. This has now been fixed. We have also implemented a new import filter, that is enabled by default. This filter prevents terminated web proxy events being imported from TMG’s Firewall Logs. There is little information logged with these events besides the bytes sent and received, and can therefore result in large bandwidth figures against blank applications, firewall rules and so on. Excluding this traffic will reduce this clutter in your dashboard and reports, and as this traffic is logged in much more detail in the Web Proxy logs, there is no loss of information. The exact filter is Firewall Action = Terminate and Destination Port = 8080. We have added sections for Source and Destination IPs, Destination Ports and the top Connections within the Firewall section of both Company overview and User Investigation reports. 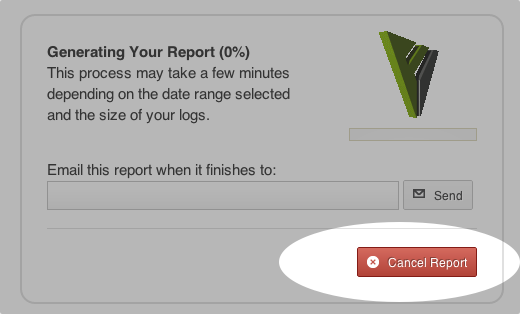 2.0.0.12 introduces the ability to cancel and delete reports. The delete function can be found in the ‘Show Existing Reports’ table. 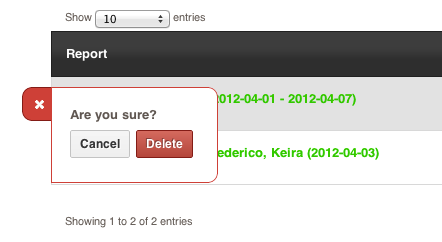 Hover over a report to display the delete option. Added a ‘Go to top’ link when scrolling through Reports. Alert operators no longer default to ‘Equal To’ on edit. Email Settings, Data Storage Settings and Site Settings have been split into separate Settings pages. Report Drawer now shows live progress for reports that are current generating. 2.0.0.12 is currently available on our download page. Simply enter your email address and click the ‘Download version 2.0 Beta (with Reporting)’ button. If you haven’t yet installed TMG Reporter, just follow the steps on our Getting Started page. The video refers to version 1.0, but the steps are exactly the same. If you already have a previous version of TMG Reporter, or Fastvue for TMG v1.0, simply uninstall your existing version before installing the new build. When installing TMG Reporter, specify the same site and data location as your previous version and your existing settings will be migrated across (TMG Sources, Productivity settings etc). It is also a good idea to restart IIS after installing the new version, and hard refresh your browser (Shift F5) to clear any caching issues that may arise. As always, we are eager to hear how you are going with Fastvue TMG Reporter. So please get in touch with us and let us know about your experience. As of the 7th of April, we will be introducing new pricing of $795 per server per year with the release of TMG Reporter 2.0. But if you purchase before the 7th of April, we’re giving it away for only $395 per server per year (the current version 1.0 price). Just send us an email with the number of TMG servers you have, and the number of years you would like to lock in this great price for, and we’ll get the ball rolling!